I went to Peru to get my groove back. At critical times in my life, I have found that adventure travel, specifically bicycling, is a powerful healing force. When I feel emotionally overwhelmed, tapping into the physical and mental strength needed to ride is a way to reconnect with myself. 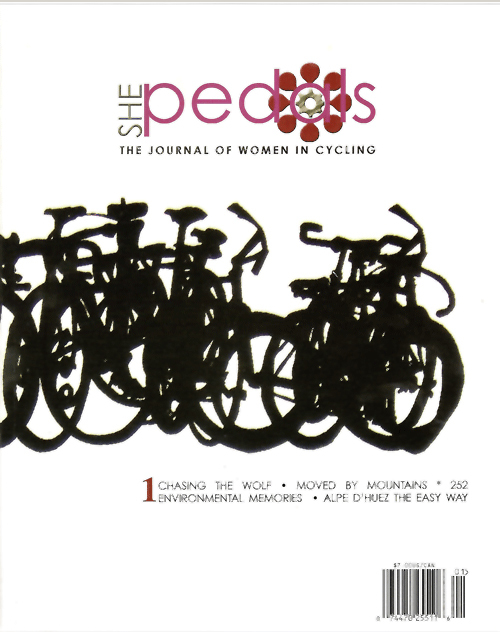 One pedal stroke at a time, I dig deep to move through challenges that can feel like mountains. So when my five-year relationship collapsed last summer and I had to abruptly cancel my wedding, the siren call of South America was irresistible. I hoped an 11-day, guided mountain bike tour in the thin air of the Andes would not be as challenging as saying farewell to my fiance. 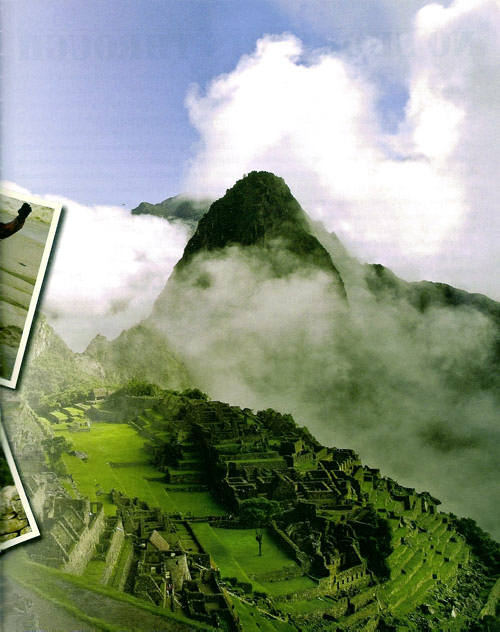 For years, Peru had topped the list of places I wanted to visit. And not just because it's home to Machu Picchu, South America's most popular attraction and one of the "New Seven Wonders of the World." 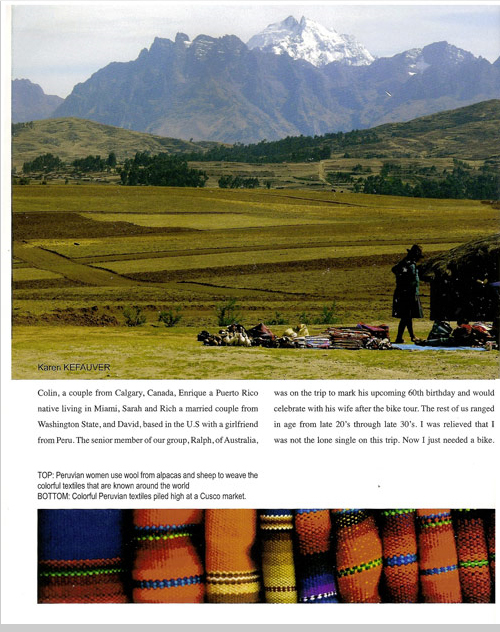 I wanted to explore a country known for its intact indigenous culture; to immerse myself in the food, language and crafts of the descendents of the Incas and other pre-Columbian civilizations. To move through my heartache, I wanted a place far from home in Central California, but not without the creature comforts of hot water and reliable electricity. 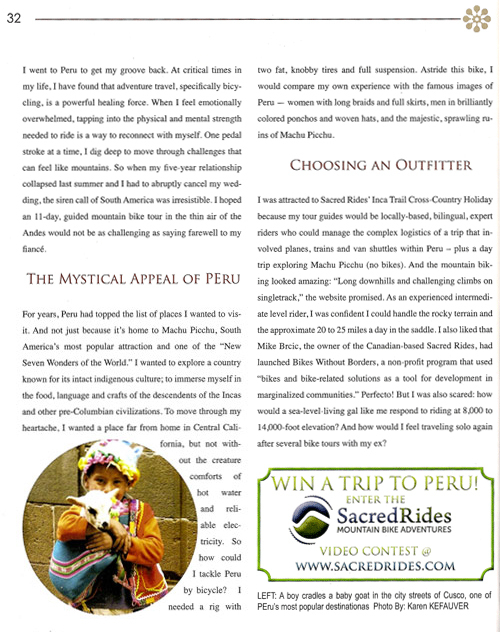 So how could I tackle Peru by bicycle? I needed a rig with two fat, knobby tires and full suspension. 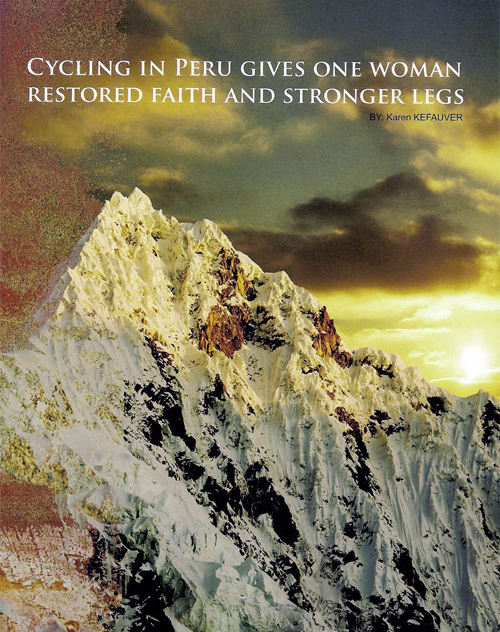 Astride this bike, I would compare my own experience with the famous images of Peru - women with long braids and full skirts, men in brilliantly colored ponchos and woven hats, and the majestic, sprawling ruins of Machu Picchu. 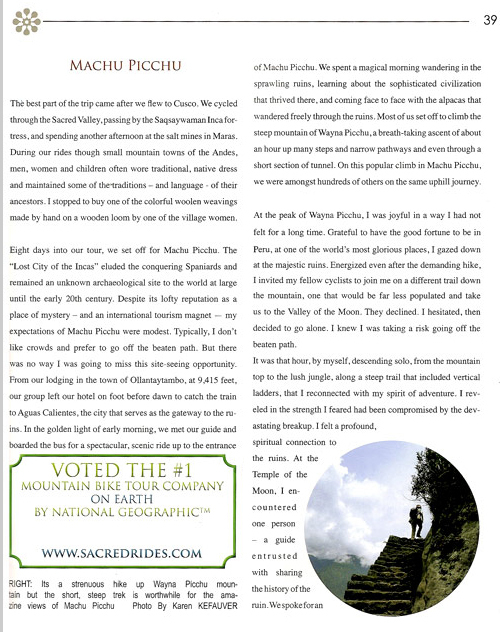 I was attracted to Sacred Rides' Inca Trail Cross-Country Holiday because my tour guides would be locally-based, bilingual, expert riders who could manage the complex logistics of a trip that involved planes, trains and van shuttles within Peru - plus a day trip exploring Machu Picchu (no bikes). And the mountain biking looked amazing: "Long downhills and challenging climbs on singletrack," the website promised. As an experienced intermediate level rider, I was confident I could handle the rocky terrain and the approximate 20 to 25 miles a day in the saddle. I also liked that Mike Breic, the owner of the Canadian-based Sacred Rides, had launched Bikes Without Borders, a non-profit program that used "bikes and bike-related solutions as a tool for development in marginalized communities." Perfecto! 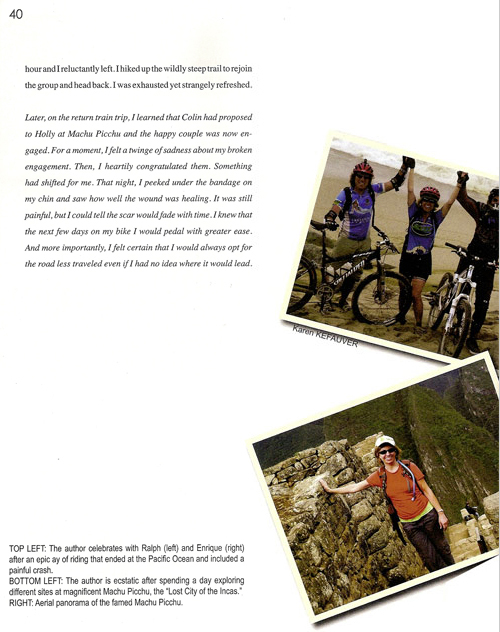 But I was also scared: how would a sea-level-living gal like me respond to riding at 8,000 to l4,000-foot elevation? And how would I feel traveling solo again after several bike tours with my ex? On a sunny September day in Peru's capital of Lima, our group gathered for introductions around the hotel breakfast buffet. The spread of scrambled eggs, white rolls, a pound cake, a bowl of fruit (melon), plus strong coffee and tea made from coca leaves would become the standard for the hotels we stayed in each night. (And yes, those same coca leaves are used to make cocaine. No, I didn't notice any stimulating effects from the tea, which is said to help ease symptoms of high altitude sickness). "Hello, mucho gusto," I said practicing my semi-fluent Spanish with Eduardo "Wayo" Stern, the handsome, bilingual guide from Lima who would be our primary tour leader. Wayo had won downhill mountain bike race titles, including national championships and also earned a master's degree in tourism. “Where’s my bicycle?” I asked him. "Um, I arranged to rent a bike here," I explained, panicking. Everyone else had brought their bicycles with them. “Just a minute,” said Wayo, and whipped out his cellphone. Meanwhile, I chatted with our international crew who would become my traveling family for the next 10 days: Holly and Colin, a couple from Calgary, Canada, Enrique a Puerto Rico native living in Miami, Sarah and Rich a married couple from Washington State, and David, based in the D.S with a girlfriend from Peru. The senior member of our group, Ralph, of Australia, was on the trip to mark his upcoming 60th birthday and would celebrate with his wife after the bike tour. The rest of us ranged in age from late 20's through late 30's. I was relieved that I was not the lone single on this trip. Now I just needed a bike. I like to think the spirits of the Incas were watching over me because Wayo produced a bike for me in the nick of time: a high-quality, full suspension Santa Cruz Blur. Was it just coincidence that I was riding a bike named for the city where I lived? For the first three days of the tour, our hostel in Lima served as a base for day-trips to Pachacamac, Huaral and Olleros. In the small community of Huaral, we visited a citrus farm that was also a breeding ground for guinea pigs. Later, at lunch, we were offered one of those guinea pigs, roasted, heads and claws included, on a platter. I declined the specialty dish, called cui, but feasted instead on baked chicken, salad, beans and rice. Braver souls in the group reported the guinea pig meat tasted "chewy." We adjusted to the altitude and each other. I didn't have problems with the high elevation other than being short of breath more than usual while pedaling. Others experienced headaches. As for our riding styles, fortunately, we were fairly compatible in skill level. We frequently regrouped so that the slower folks could catch up to the leaders. At times, I felt sad watching the bantering couples, recalling the bike tours I had done with my former partner. I missed him despite myself, especially when I crashed hard one afternoon, on my face. I was excited for our third day of riding which promised the longest trail of the trip at 56km and our first venture into the Andes. Our guide Wayo told us we would be in the saddle for at least five hours. We loaded our bikes onto the top of the van, (which we used almost daily to drive to the start of our rides,) and set out at 6:30 a.m. I was dressed in layers and equipped with a full hydration pack of water and two full bottles on my bike. We began a gentle climb, the first of several hills. My 38-year-old body, already tired from travel and riding, eased back into the groove of slow, steady pedal revolutions. I looked at the adobe brick houses and imagined life there: what would it be like to disconnect from my highly wired life near Silicon Valley? Passing through villages with the pigs, goats and chickens and cows, I felt energized being so far away. A small cluster of homes formed Buena Vista. I watched an elderly couple stare as we rode by, then smile and wave as we greeted them in Spanish. The sun beat down on my back. I shed layers of cycling clothes as we headed towards the town of Santo Domingo de los Olleros, in the Lurin Valley, We reached the town at 10,683 feet! After a well-earned rest and tasty lunch, our group was ready to descend on one of Peru's most epic downhills—15 miles of pure singletrack! I had to focus intently on the downhill in order to avoid big, loose rocks on the trail. I prayed I wouldn't fly over the steep cliff on one of the dizzying, tight switchbacks. On perilous sections, where a fall would have had tragic consequences, I got off and walked my bike - and so did others. 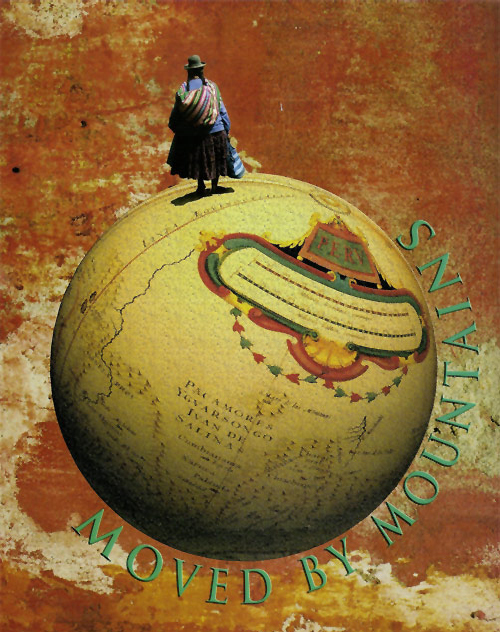 Yet, on this challenging mountainside, I started to feel a sense of mastery, so I went faster. Despite the thrill of the technical descent, I felt my legs fatigue as we headed towards the Pacific Ocean. On one narrow, rocky section with a steep drop, my front tired skidded on a comer. I fell hard against the rock wall (better than off the cliff!) I scraped my chin as I went down. My legs and arms were bruised and scraped, but what scared me most was wiping away blood on my chin: I would be scarred for life, I would need plastic surgery! An assistant guide joined me with his medical kit and helped clean me up. He also kindly reassured me, but that was not enough. I was exhausted and wanted a shoulder to cry on. I felt so alone. Shaken, I walked my bike for a while to regain my composure. I felt blue even after the joy of finally reaching the ocean by dusk. I realized my distress was deeper than the scrape: it was the realization that I did not have a significant other to lean on when the going got rough. That evening, a bulky bandage covering the cut on my chin, I wondered if corning on the trip was such a good idea after all. 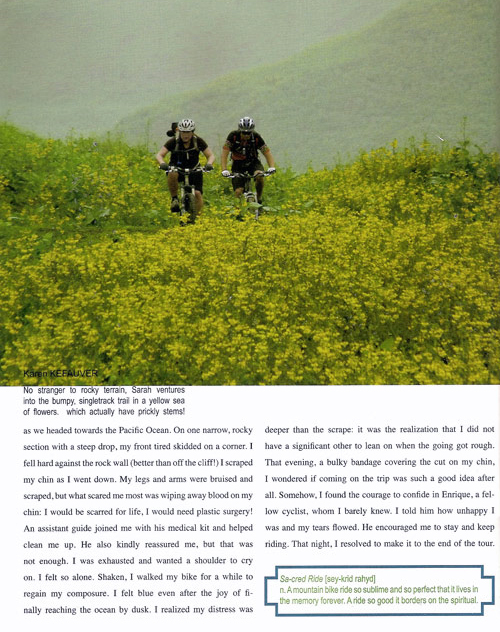 Somehow, I found the courage to confide in Enrique, a fellow cyclist, whom I barely knew. I told him how unhappy I was and my tears flowed. He encouraged me to stay and keep riding. That night, I resolved to make it to the end of the tour. The best part of the trip came after we flew to Cusco. We cycled through the Sacred Valley, passing by the Saqsaywaman Inca fortress, and spending another afternoon at the salt mines in Maras. During our rides though small mountain towns of the Andes, men, women and children often wore traditional, native dress and maintained some of the traditions - and language - of their ancestors. 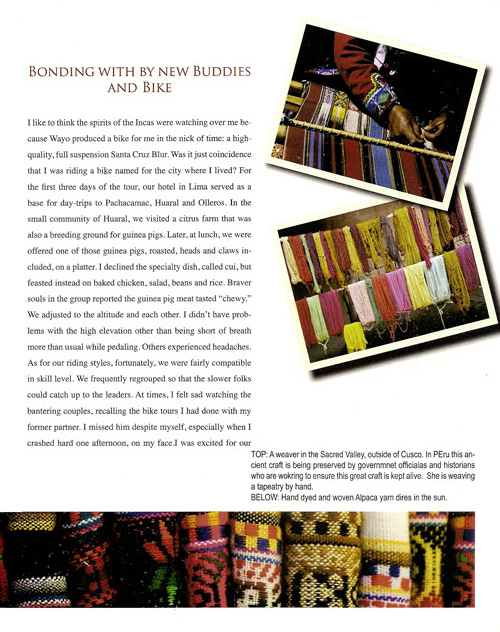 I stopped to buy one of the colorful woolen weavings made by hand on a wooden loom by one of the village women. Eight days into our tour, we set off for Machu Picchu. The "Lost City of the Incas" eluded the conquering Spaniards and remained an unknown archaeological site to the world at large until the early 20th century. Despite its lofty reputation as a place of mystery - and an international tourism magnet - my expectations of Machu Picchu were modest. Typically, I don't like crowds and prefer to go off the beaten path. But there was no way I was going to miss this site-seeing opportunity. From our lodging in the town of Ollantaytambo, at 9,415 feet, our group left our hotel on foot before dawn to catch the train to Aguas Calientes, the city that serves as the gateway to the ruins. In the golden light of early morning, we met our guide and boarded the bus for a spectacular, scenic ride up to the entrance of Machu Picchu. We spent a magical morning wandering in the sprawling ruins, learning about the sophisticated civilization that thrived there, and coming face to face with the alpacas that wandered freely through the ruins. Most of us set off to climb the steep mountain of Wayna Picchu, a breath-taking ascent of about an hour up many steps and narrow pathways and even through a short section of tunnel. On this popular climb in Machu Picchu, we were amongst hundreds of others on the same uphill journey. At the peak of Wayna Picchu, I was joyful in a way I had not felt for a long time. Grateful to have the good fortune to be in Peru, at one of the world's most glorious places, I gazed down at the majestic ruins. Energized even after the demanding hike, I invited my fellow cyclists to join me on a different trail down the mountain, one that would be far less populated and take us to the Valley of the Moon. They declined. I hesitated, then decided to go alone. I knew I was taking a risk going off the beaten path. It was that hour, by myself, descending solo, from the mountain top to the lush jungle, along a steep trail that included vertical ladders, that I reconnected with my spirit of adventure. I reveled in the strength I feared had been compromised by the devastating breakup. I felt a profound, spiritual connection to the ruins. At the Temple of the Moon, I encountered one person - a guide entrusted with sharing the history of the ruin. We spoke for an hour and I reluctantly left. I hiked up the wildly steep trail to rejoin the group and head back. I was exhausted yet strangely refreshed. Later, on the return train trip, I learned that Colin had proposed to Holly at Machu Picchu and the happy couple was now engaged. For a moment, I felt a twinge of sadness about my broken engagement. Then, I heartily congratulated them. Something had shifted for me. That night, I peeked under the bandage on my chin and saw how well the wound was healing. It was still painful, but I could tell the scar would fade with time. I knew that the next few days on my bike I would pedal with greater ease. And more importantly, I felt certain that I would always opt for the road less traveled even if I had no idea where it would lead.